A favourite book for adapting into a massage story is We’re Going on a Bear Hunt by Michael Rosen. Tracy Greenwood, a specialist teaching assistant responsible for sensory needs, explains how she uses this book as a sensory story for children with special educational needs. Tracy has recently been presented with a Best Practice Award for her inspiring work. 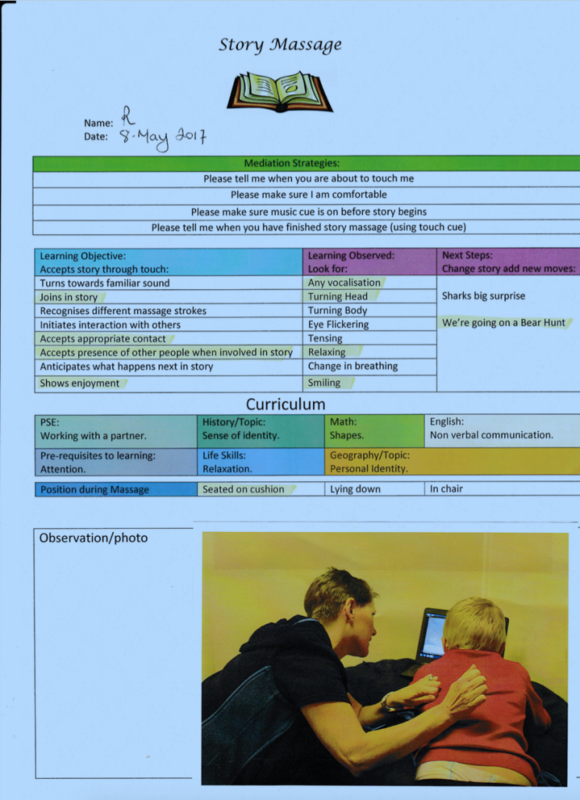 One boy with autism was fully engaged in the session for 20 minutes and at one point he turned his head and snuggled into Tracy’s neck which showed he was accepting her closeness. Tracy says the massage story encouraged expressive language as he also mimicked sounds in the story. A visually impaired girl really giggled and interacted with smiles and laughter. Tracy says the smiling and vocalisation continued throughout the story, showing that she was not only aware of the story, but was becoming more involved and enjoyed the strokes on her body. A girl with PMLD began to move her arms independently during the story and they relaxed and became outstretched, a huge benefit for encouraging blood flow into her muscles. Tracy says her body completely relaxed and her facial expressions were of enjoyment. She is hoping that Story Massage will complement her physiotherapy programme. Take a look at the heart warming video of a young girl engaging in a Story Massage session. 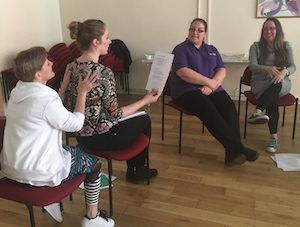 The adult is Cheryl Bailey, a teaching assistant, who attended our Story Massage training day and works with Tracy Greenwood. Consent is an important part of Story Massage for children with special educational needs. And Tracy and Cheryl always work with each individual child to gain consent before a session begins. This may be a movement of the arm or head, or taking a hand. They are also currently working together to develop a touch cue appropriate for all the children in the school. The cue would be used at the beginning of every massage story so they know what to expect. Story Massage combines the benefits of positive, respectful touch with the creativity and engagement of storytelling. Ten simple massage strokes form the basis of the Story Massage programme. These strokes have a child friendly name, such as The Circle or The Sprinkle, and an easy to recognise symbol making it accessible for all. It is a fully inclusive activity, no clothing is removed and no oil is used. Stories can be taken from our Story Massage book, adapted from favourite stories such as We’re Going on a Bear Hunt. 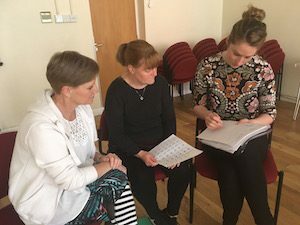 Are you inspired by the way that Tracy and Cheryl are adapting Story Massage for children with special education needs? Would you like to train to use Story Massage in your work or home? We run a one day accredited training course held around the country for individuals and groups. These days can also be organised as in-house training sessions. And we have a new online training option.